What if we told you signing up with a new distributor can be easy and you could be buying new craft spirits & wine online in a matter of minutes? As a bartender, restaurateur, sommelier, or retailer, you know all too well the challenges of working with a a new distributor. Credit apps and another rep to deal with weekly…it can be daunting! Especially when you’re already working with several distributors that you like and trust. It’s easy to stick to your old ways. After all, you’re super busy. What if we told you signing up with a new distributor can be easy? What if we told you that you can start shopping online for hard to find spirits and wines? What if that online experience had incredibly rich content about the supplier and products, a sample request button. and direct lines of communications with the wineries and distilleries themselves? Making it easy for resellers is what we’re all about. We designed our LibDib for that very reason. We are constantly updating our platform with feedback from our amazing reseller customers. 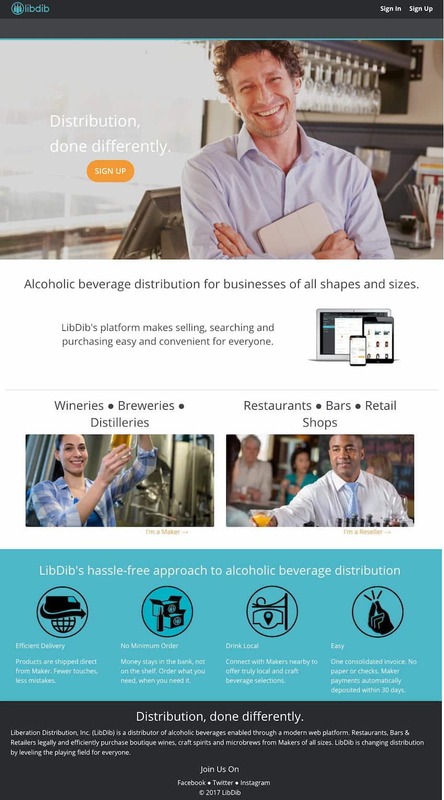 LibDib has easy to use product categories, favorites lists, handy reorder reminders, and other tools, to make it easy for you to buy craft spirits and small production wines. Here’s a quick summary of LibDib’s sign-up process. Sign up online. Upload your license. Receive approval lickity split. Start shopping and be amazed by our selection. Enjoy clearly set credit terms. Products are delivered via common carrier or by one of our distributor partners (depending on the market). Invoices come with the delivery as well as via email. Developed with your needs in mind. Super easy. Super efficient.